The fifth volume of Sumeragi's Mame Sengoku Basara ('Bean Sengoku Basara') manga was also its last; after these chapters were serialised the series ended its run in Dengeki Maoh magazine and was replaced by the new Mame Sengoku Basara 4 series. The final chapters were collected in this book and released on 27th March 2014 by ASCII Media Works. There are nine chapters of the manga spread over 128 pages and priced at ¥780 before tax. Mame Sengoku Basara volume 5 can be purchased from import stores such as Yesasia, Amazon Japan (also on Kindle), CD Japan or Apple's iBooks Store. I'll summarise the stories one by one, as is traditional. The first chapter of this book is all about Keiji paying a visit to Tsuruhime. He's surprised to find the oracle isn't feeling too good and soon realises that she's lovesick over Kotarou. Keiji convinces Tsuruhime that the best way to deal with her feelings is to try writing a love letter for the mysterious ninja. There are a few cute 4-panel comic strips with extra punchlines after this chapter as an added bonus. The second story has Mitsunari looking after Motochika's parrot (with a little help from Yoshitsugu). The parrot has developed a habit of imitating the voice of Motochika's friend Ieyasu, something which never fails to drive Mitsunari into a furious rage. Next comes a very short four-page story about Sourin. He's not been having very much luck increasing support for Xavism, so Muneshige has to round up some promising men to bring light to the future of the country. Muneshige selects Hisahide, Kojuurou and Ieyasu, and Sourin isn't too pleased. The fourth chapter is about the Date army. The soldiers are perturbed by a sudden change in Kojuurou's mood, not realising that it's harvesting season - a wonderful time of year for a person who loves tending crops as much as Kojuurou does. Keiji and Ieyasu take the spotlight in the next story as the former decides to teach Ieyasu more about the meaning of the bonds he loves so much by taking him to a festival (naturally). The theme is 'regional specialities' so Ieyasu eagerly explores the different local foods and handicrafts that each area has on display. The pint-sized warriors are all very proud of their homelands. The festival spirit then gives way to a more mischievous atmosphere when four of the more tactical characters form a helpful group. Their purpose is to listen to the problems their fellow warriors are facing and provide advice. The results are varied, to say the least. Nagamasa's heroic 'Justice Sentai: Azai Rangers' are the star of the next chapter; sadly the Gohonyari don't make an appearance as Nagamasa and Oichi are both members of the team this time. They travel around the country fighting for justice - and helping out with the Maeda family's chores. The regular chapters are then interrupted by the shucchouban ('excursion') spin-off story from Sengoku Basara Magazine. Ieyasu studies bonds with Toshiie and Matsu whilst worrying deeply about how Keiji must be feeling after Hideyoshi's death. It's a surprisingly dramatic story for the Mame Sengoku Basara series, and the cute-looking designs make Ieyasu's anguish extra sad. The last chapter of Mame Sengoku Basara finally tells the story of the Battle of Sekigahara that was teased way back in the very first volume. The dramatic showdown between Mitsunari and Ieyasu is interrupted when all of the other characters arrive and start brawling. Keiji breaks up the fighting and before long a festive atmosphere descends over the battlefield. I like how Sumeragi was able to incorporate a large number of references to the actual storylines from Sengoku Basara 3. The battle ends with a picture of Katsuie and Sakon from behind, setting the stage for the new Mame Sengoku Basara 4 series. I was devastated when I heard that this delightful series was coming to an end, so learning that it was simply being relaunched as Mame Sengoku Basara 4 was wonderful news. This volume is a perfect send-off, with appearances from almost every character in the history of the series and a mixture of comical stories. Seeing Keiji on the cover was a real treat. It's strange; I was always perfectly happy with the (already large) cast in Mame Sengoku Basara but ever since Sengoku Basara 4 came out I've been wanting to see the new characters appearing as well. It already feels as though something is missing when they're not around. 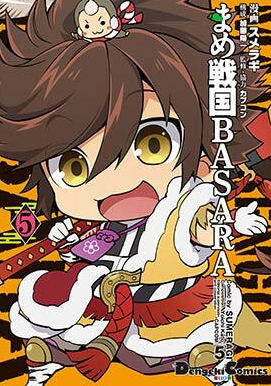 I'm ready for the first volume of Mame Sengoku Basara 4 as soon as it's available!